Iron any garment from cotton to cashmere with confidence and ease! Continuous steam output - up to 34g per minute; efficiently removes creases. 180g power shot for vertical steaming and tough creases. 3-way self-cleaning system, including anti- calcium system. Anti-drip system - inner water seal protects fabrics from water spotting. 3-way auto shut-off, mercury-free electronic sensor automatically shuts off iron after 10 minutes if left in upright position. Patented dual tip curved soleplate - allows for quick and effortless multi-directional ironing. Iron any garment from cotton to cashmere; satin to denim- with confidence and ease. No temperature adjustment, no burning, no shine. Simply perfect results every time. Perfectly combines a constant low temperature with powerful steam to safely iron clothing. No temperature settings, no confusion. Safe on all fabrics, even the most delicate materials such as silk. Can remain in horizontal position on ironing board as well. Sharper front angle for better visibility while ironing. New, W-shapes soleplate edges for precise ironing. Advanced ceramic soleplate for even smoother ironing. 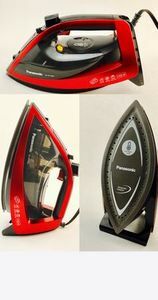 Iron is ready in 1 minute due to Panasonic's unique, patent-pending steam circulation system. Even after dry ironing (without the use of steam), the Optimal Care Iron leaves no marks!